Periods can be painful and messy, and it’s a public health issue no one really talks about. According to a 2012 study, 96 per cent of the female workforce (it’s 91 for males) is employed in the informal sector, where staying home due to menstrual pain usually means losing a day’s wages or, worse, getting replaced. So it did seem like a step in the right direction when a Mumbai-based digital media company last year announced that all female employees can be on paid leave on the first day of their period every month. But ensuring that the first-day off is also extended to the overwhelming majority of women is more difficult than ensuring minimum wages are paid, which too isn’t often the case. So does menstruation add to the odds stacked against women at work? Different women have different experiences with the menstrual cycle. While some breeze through their periods, many others face severe pain, heavy bleeding, headache, nausea, depression and sleeplessness. 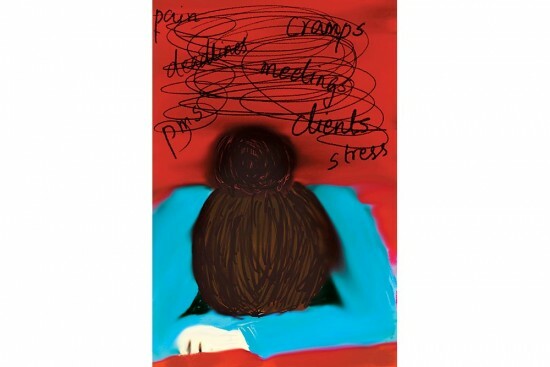 According to Dr Rishma Dhillon Pai, consultant ­gynaecologist at Jaslok Hospital and Research Centre, Mumbai, menstrual pain or dysmenorrhoea affects nearly half of the women in the working age group, and 20 per cent of them may suffer from endometriosis or fibroids that may cause severe pain and bleeding. Won’t more leaves accentuate the hiring bias against women, given maternity leave is sometimes informally cited as a reason to avoid hiring them in the reproductive age bracket? But even the idea of maternity leave had faced much resistance from employers, and is one of the gains of the struggles of women workers for their workplace rights. Women organised and agitated against the conditions that turned their capacity to be mothers into a disempowering factor for them vis-à-vis their employers—more cost-efficient as workers than men as they could be made to work more for less wages, with employers weighing their wages against the risk that they might have to be replaced on becoming mothers. As there were always others out of work and looking for a job, women mostly had to settle for lower wages and their average wage across sectors has been lower than men doing the same or comparable work. The nature of work influences how menstrual problems affect women.An officegoer and a farm worker would be affected in different ways. Now that the concept of maternity leave has gained acceptance and has been written into labour laws in most parts of the world, inc­luding India (Maternity Benefit Act, 1961), doesn’t ­‘period leave’, which too ­relates to a physiological ­process unique to women—and one encountered every month from puberty to ­menopause—deserve similar attention? Currently, menstrual leave is available to women in Japan, South Korea, Taiwan and some provinces in China. In India, the directive ­principles of state policy ­enshrined in the Const­itut­ion contain provisions ­reco­mmending that the State should enact laws for the welfare of woman workers. Article 42 says it is among the State’s goals to ensure just and humane conditions of work, including maternity rel­ief. This means a law ena­c­ted in that light would be uph­eld as constitutionally valid. Dr Veena Aurangabadwala, a gynaecologist at Zen Multispeciality Hospital, Mumbai, says, “Instead of asking for period leave, women should focus on ­improving their pain endurance and fitness, by having certain minimum hours of physical exercise every week.” Many women manage their periods with pain relievers, warm baths or hot fomen­tation. If the discomfort is so much that it stops a woman from working, then she must be evaluated by a gyn­aecologist to rule out any pathological cause such as endometriosis or fibroids. Employers too can explore options other than granting period leave. “They can inc­rease the number of casual or sick leaves for their female workforce. They can leverage technology wherever possible to offer telecommuting and work-from-home opti­ons,” says Rituparna Chak­raborty, ­president of the Indian Staffing Federation.